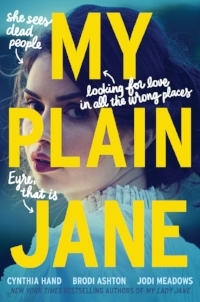 MY PLAIN JANE Receives ⭐️ Review from School Library Journal! MEADOWS, Jodi. Before She Ignites. 496p. (A Fallen Isles Novel).HarperCollins/Katherine Tegen Bks. Sept. 2017. Tr $17.99. ISBN 9780062469403. "Interspersed with flashback chapters, the novel is fairly fast-paced with surprising twists and turns. This richly written fantasy—the first in a trilogy—will keep readers asking whom to trust and wondering what’s true. For fans of Three Dark Crowns by Kendare Blake, Long May She Reign by Rhiannon Thomas, and Graceling by Kristin Cashore. VERDICT A must-have for YA collections, especially where the author and fantasy is popular." –Rebecca Greer, Hillsborough County Public Library Cooperative, FL"